CHESS Legend, Kasparov Arrives in Abuja on Thursday, Read Details of His Visit. 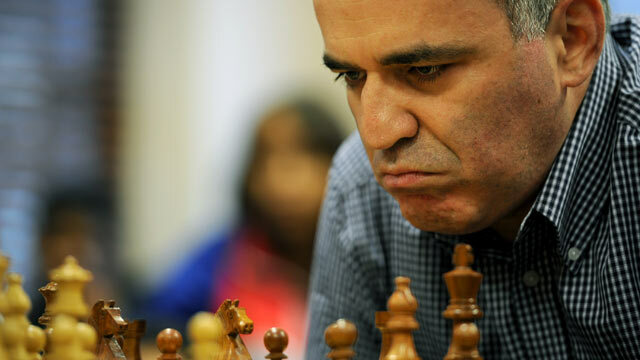 Chess legend Garry Kasparov will arrive in Nigeria this week as part of his chess campaign’s visit to West Africa. The 50-year-old and his Kasparov Chess Foundation (KCF) will arrive on the evening of Thursday, 30 January. The board of the Nigeria Chess Federation (NCF) will welcome greatest chess player of all-time on Thursday evening at the Hilton Hotel, Abuja. The combined team of KCF-Africa and the NCF board will visit the Hon. Minister and Chairman, National Sports Commission (NSC), Bolaji Abdullahi, The Honourable Minister of Education and the Executive and the Exceutive Secretary, Universal Basic Education on Friday, 31 January. The team would be hosted later in the evening by the Managing Director/CEO, Nigerian Sovereign Investment Authority, Uche Orji, in Abuja. KCF-Africa depart Abuja for Lagos on Friday. Alhaji Aliko Dangote will hosts the team on 1 February by 11am. The team would meet with stakeholders of the Nigeria Chess parlance, have a press briefing and also meet with various corporate organisations e;g Nigeria Breweries PLC. The team is expected to depart the country in the afternoon of 2 February, 2014. Next stop, Senegal! Then Ivory Coast, Ghana, Nigeria (with more visits to come). Any West African chessplayers here? Mercedes’ Lewis Hamilton Takes Lead Ahead of Sunday’s Chinese Grand Prix. Neville Hangs Up on His Playing Career. Cardiff City Names Solskjaer as New Manager. Germany International, Schurrle Agrees to Move to Stamford Bridge. Next article[Advice Needed] My Parents Gave Me A Week To Give Him Consent To His Marriage Proposal. I Am Confused, Please Help! What Is Going On In Maiduguri?